In a world that seems to be growing more technologically savvy every day, we must be prepared for anything, from phishing scams to ransomware attacks. But, what if the threat to your business and data isn’t from technological warfare? What if something incredibly simple could cause your business to lose data? The National Lightning Safety Institute reports that “Computer damage and data loss from lightning strikes cost the United States nearly $2 billion in an annual economic loss.” When lightning strikes, it causes a power surge. This change in current can have enormous repercussions for your computer’s systems and data. It may not be from mother nature but rather human error. A technician in 2011, made a mistake when switching out major equipment. This one mistake caused 12 hours without power for over 2.7 million American industries, businesses, and residences. Power interruptions can be catastrophic. But the good news is that it doesn’t have to be. Something as simple as a UPS (Uninterruptable Power Supply) could save your business. A UPS (Uninterruptable Power Supply) protects against certain power problems. Mainly it protects against blackouts, brownouts, noise, spikes, and power surges. Each of these provides a different challenge to your computer systems, and, if left unrestricted, they could have a devastating effect. So, how does a UPS protect your computers? Blackouts are one of the more commonly known terms in relation to power problems. Blackouts occur when the system experiences a total crash of the power grid due to an imbalance between a generation and its consumption. Sometimes this could be a total blackout, while other times a controlled shutdown is applied to a specific area to avoid a complete blackout. Brownouts aren’t as well-known but are just as destructive. While a blackout is a total loss of voltage, a brownout is a drop in voltage. This means that you will still have power just less of it. This can last anywhere from a few minutes to a few hours. While this sounds innocent enough, a brownout is capable of ruining your electronic devices within a few minutes. Noise is caused by interference between lightning and generators. While this sounds minor, it can cause malfunctions throughout your computer operating systems. This lesser-known power problem has also been known to corrupt files. Spikes are sudden increases in voltage. Usually, these are short-lived flare-ups in electric current caused by lightning. Another cause for spikes is when power is restored after a blackout. When power is restored it takes some time for the current to normalize. If electronics are plugged in when a spike occurs, they could suffer negative effects. A Power Surge is the equal and opposite of brownouts. While brownouts are a decrease in power, power surges are an increase in power. Like brownouts, these are short-lived, however, they still cause significant damage, especially to large appliances like refrigerators or air conditioners. How often do power problems like these occur? The Department of Energy compiled a report showing the cost of power outages in the past 15 years. It also includes the number of customers affected. For example, in 2014 severe thunderstorms in Illinois caused a power outage for two days. Within these two days, over 420,000 customers were affected. And, in less than a day, severe weather (snow and ice) in Pennsylvania caused power problems that affected 715,000 customers. Anyone of these affected customers could be your business. If so, would you have the tools to protect your computers and data? So, how does a UPS (Uninterruptable Power Supply) protect your computer and data? It detects changes in the electrical current and stabilizes it, so your computers aren’t harmed. When shopping for a UPS for your business, you should first do some research to determine what best fits your company’s needs. There are two main types of Uninterruptable Power Supply solutions: Standby UPS and Line Interactive UPS. A Standby UPS protects against outages and power surges. It constantly monitors the voltage-current to detect inconsistencies. 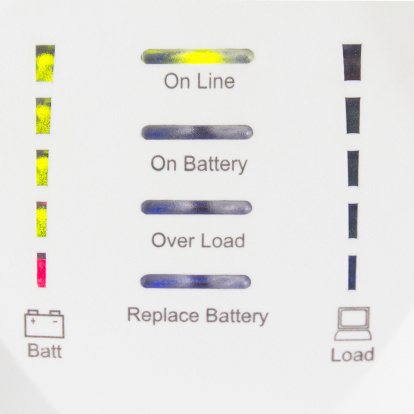 If it recognizes a surge or outage, it immediately switches to battery power. This allows your systems to continue running without power interruption. A Standby UPS is best suited for a business with one computer hub because it can’t support numerous computer hubs at once. These typically cost between $200-$500. A Line Interactive UPS works best to protect your computers and data against long-term issues. Line Interactive UPS works to constantly stabilize the voltage-current that supplies power to your business. It does this via a regulator that automatically boosts or reduces the incoming line voltage, and without switching to battery power, which can prolong the life of the battery in the long run. These typically cost between $500-$1,200. A UPS costs anywhere between $200-$1,200—This seems a fair price for the peace of mind that it can offer. It’s a simple yet effective tool to protect your IT investments. Not only would you risk losing your computer, but you could also lose the data it holds. The National Weather Service states that on average, each year 22 million cloud-to-ground lightning flashes hit the United States and surrounding coastal waters. Anyone of these 22 million could cause you to lose your computers and your data. Since you never know when lightning could strike, you should be prepared for it.